/ Gold / Gold News / Silver – The World’s Most Undervalued Asset? Silver – The World’s Most Undervalued Asset? Silver dipped to $19.10/oz overnight and remains under pressure this morning . With the gold: silver ratio at just over 66 ($1,290/$19.38/oz), silver remains a compelling buy at these levels. The stealth phenomenon that is silver stackers or long term store of value buyers of silver coins and bars continues and is seen in the record levels of demand for silver eagles from the U.S. Mint. The US Mint sold 13,879,000 ounces of me in Q1, 2014. This is just over 2% less than the 14,223,000 sold in the first quarter last year. March sales were the fourth-biggest month ever and the US Mint is now on pace to exceed 2013 totals. Silver stackers remain the smart, informed buyers. They realize that silver is undervalued versus gold with the gold silver ratio at 66:1. This is particularly the case on a long term historical basis. 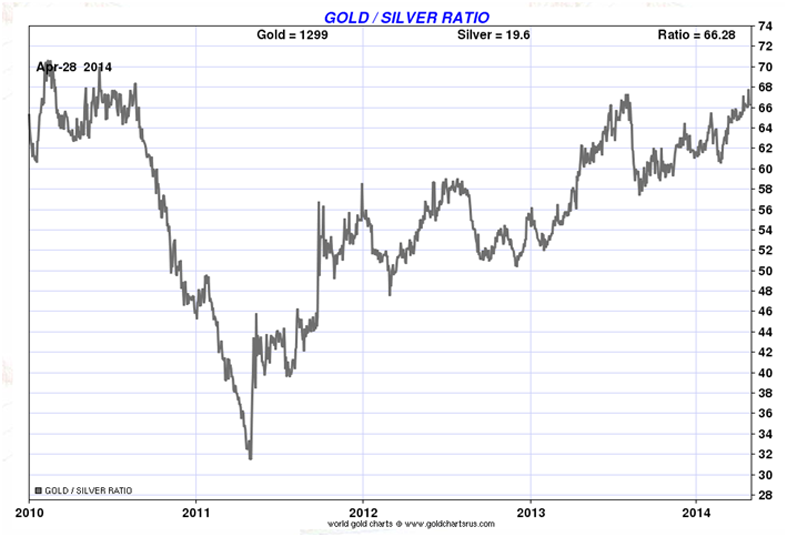 The long term historical average, gold to silver ratio is 15:1. Silver industrial and investment demand is increasing very significantly and meanwhile supply is falling. The fact that the huge majority of the investment public and financial services industry remains unaware of the fundamentals in silver means that the bull market in silver likely remains in its intermediate stage. Today’s AM fix was USD 1,289.75, EUR 930.02 and GBP 767.07 per ounce. Yesterday’s AM fix was USD 1,302.00, EUR 938.45 and GBP 772.79 per ounce. Gold fell $6.10 or 0.47% yesterday to $1,296.60/oz. Silver slipped $0.12 or 0.61% yesterday to $19.59/oz. Gold and silver fell for a second straight session today despite escalating tensions between Russia and the West. Markets await this week’s U.S. jobs report and a Federal Reserve policy meeting for further hints regarding the fragile U.S. economy and the extent to which ultra loose monetary policies will continue. Tensions between the West and Russia over Ukraine remained very high after the United States imposed new sanctions on key Russian business figures. This prompted Moscow to denounce “Cold War” tactics. President Obama announced the U.S. would impose a new round of sanctions on individuals and companies in Russia. Obama said the sanctions will focus on “some areas of high-tech defense exports” to Russia. Violence continues in eastern Ukraine and risks deteriorating. The Cold War rhetoric and geopolitical risk is being overlooked for now. In the physical markets, data showed China’s gold purchases via main conduit Hong Kong fell to a four-month low in March. 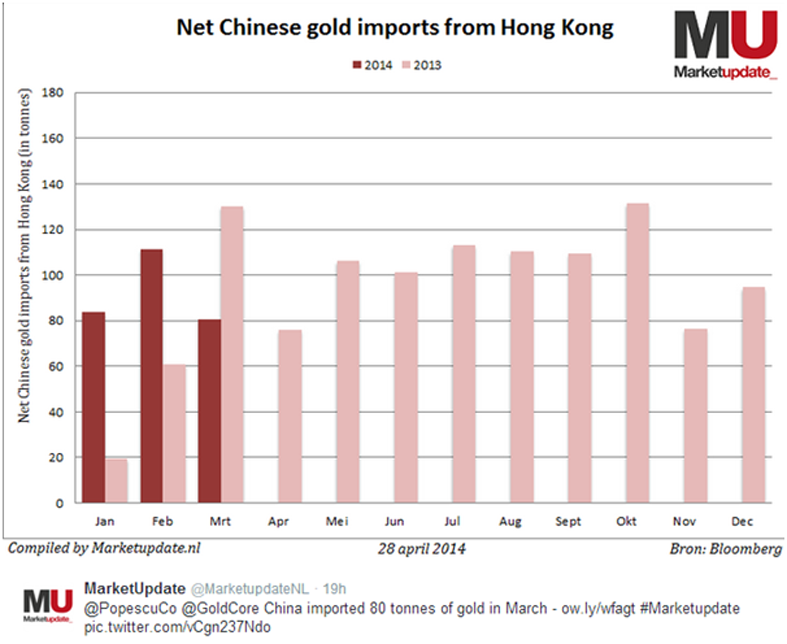 Net gold imports totaled 80.6 metric tons in March, compared with 111.4 tons in February. Imports remained very high in the first quarter and are on track to equal the record level of demand seen in 2013 (see chart). Shanghai gold prices have now recovered to a premium of about $1 an ounce indicating a slight uptick in demand. An increase in physical demand across Asia appears to be providing a strong floor for gold. The stealth phenomenon that is silver stackers or long term store of value buyers of silver coins and bars continues and is seen in the record levels of demand for silver eagles from the U.S. Mint. The US Mint sold 13,879,000 ounces of me in Q1, 2014. This is just over 2% less than the 14,223,000 sold in the first quarter last year. March sales were the fourth-biggest month ever and the US Mint is now on pace to exceed 2013 totals. This is because it is estimated that geologically there are some 15 parts of silver in the ground for every 1 part of gold. In 1980 the ratio nearly reached 15 ($850oz/$50oz=17) and the average in the 20th century has been around 40:1. Silver is unique in terms of being both a monetary and an industrial metal. Silver’s industrial uses should mean that the gold silver ratio will likely gradually regress to the average in the last 100 hundred years. If the tiny silver market was to see significant investment funds enter it than the ratio could return closer to the historical average of 15:1 as it did as recently as 1980. Silver is undervalued when compared with gold, platinum, palladium, base metals including copper, oil, stocks and the DJIA and Nasdaq, bonds and the U.S. dollar. Ted Butler has an excellent research note on this today with some excellent charts showing silver’s relative value to these benchmarks. Silver at below $20/oz, remains less than half of its nominal record price in 1980 and very undervalued from a historical basis. The average nominal price of silver in 1979 and 1980 was $21.80/oz and $16.39/oz respectively. There are very few, if any assets that remain at the same price levels as they were more than 30 years ago. In today’s dollars and adjusted for inflation that would equate to an inflation adjusted average price of some $60/oz and $44/oz in 1979 and 1980. It is for this reason that we believe silver will be valued at well over $50/oz in the coming years and silver remains an incredible opportunity. 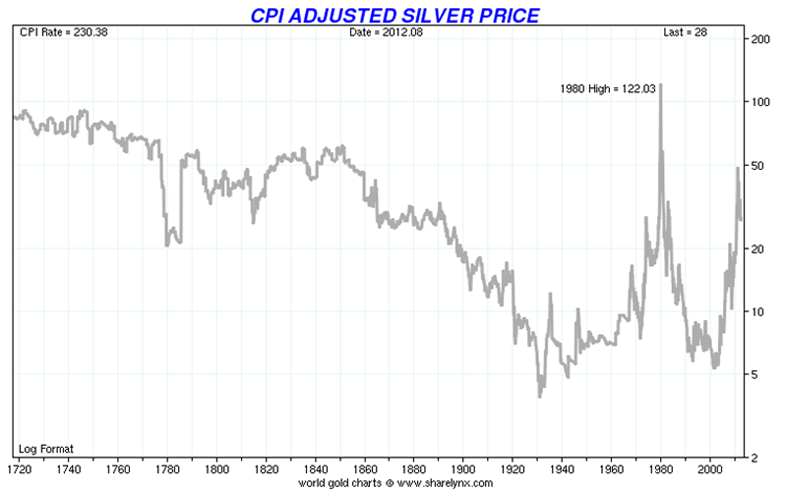 A picture or a chart truly is worth a thousand words and the chart above showing silver prices adjusted for inflation shows how undervalued silver remains. Silver, like gold, has been and is increasingly again being regarded by many investment managers as a great financial hedge against terrorism, war, fiat currency crises, deflation, inflation, stagflation and even the worst case scenario of hyperinflation. Today, people in Iceland, Cyprus, Iran and Ukraine can attest to the value of silver as a store of value against currency devaluation.